After many years of being addicted to reading, I started a book review blog. with questions, suggestions and of course, book offers! The title is so provocative, I loved it even before I got the book. 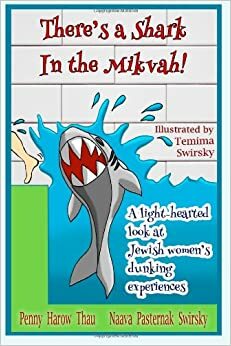 There's a Shark in the Mikvah! * is a book of comic relief for a potentially anxiety filled mitzva, as well as some food for thought and light inspiration. This is a fun book complete with illustrations! Now don't get scared, its completely tznius. The size of the book is also great. Its small and thin enough to hide in your purse or under your pillow, yet thick enough that you feel satisfied with the collection of stories that it holds. The stories, gathered anonymously, are from all over. Dunkers and watchers. Small towns and cities, Israel, US and beyond. Ashkenazy and Sefardy. More religious and less so. There is a disclaimer in the beginning of the book that if anything doesn't sound right, ask your Rabbi. If I could, I would give this book to every balanit, kalla and Rebbetzin, if I could. Not to mention anyone else I would potentially meet at the mikva. I would also recommend it to all kalla teachers to share. As a married woman for under five years, I felt that this book really gave me perspective for any semi-awkward situation I was in. My husband even enjoyed learning about the range of dipping experiences. While I loved the flow of the illustrations, I think they could have been improved with some computer manipulation. Its easy to darken the lines to make them more crisp or to lay the text around the image. Again this is just my opinion on how the adorable drawings could be a bit better. I love love this book. Its an awesome feeling that I belong to this club of anonymous woman who also cherish this mitzva and can smile instead of gritting their teeth. I strongly feel that nowadays the Jewish nation needs more books like this one. Mitzvos, no matter how serious or hard, should be able to be loved and filled with happiness. This book also unites all mitzva doers, which is truly beautiful. I received this book for the purpose of reviewing it, but that it no way changed the way I read it and reviewed it. If you like what you see, please subscribe to my latest posts! Once you do, your friends will also be able to enjoy the reviews.